The Tower of Babel. The Great Pyramids. The Leaning Tower of Pisa. 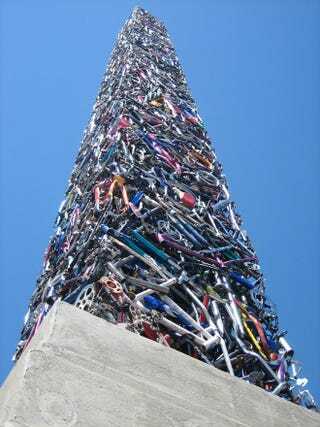 That pantheon of epic structures wasn't compete until Cyclisk: a 65-foot tall, 10,000-pound obelisk comprising about 340 bicycles, a tricycle, and a healthy disregard for proportion. The sculpture, which resides in Santa Rosa, California, was built by artists Mark Grieve and Ilana Spector, and cost $37,000 to build. That's a lot of Schwinn.